Ridham Desai, strategist and head of India Equity Research at Morgan Stanley India, doesn't believe in consensus. 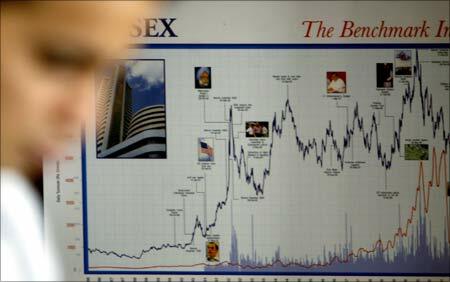 In fact, he has a chart that tracks the average ratings on all the stocks covered in India (about 350), which shows consensus ratings of the bottom six months after the market bottomed and the top six months after the market has topped. "The highest ratings on the market were in June 2008. Everybody is screaming 'Buy! Buy!' The lowest ratings for the market was in February 2009. Everybody was saying, 'Sell, sell,' he says in an interview with Sachin P Mampatta and Samie Modak. He is quick to add it has nothing to do with the abilities of analysts, but is a problem with consensus of any sort. 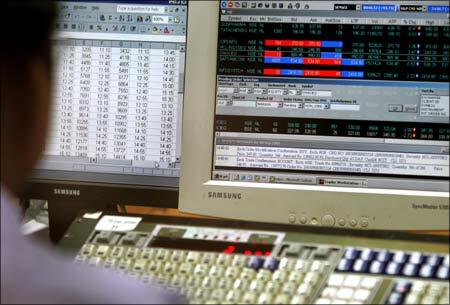 The market is pricing in around eight per #162 he expects mid- to high-teens by March 2014 and is bullish on the prospects for Indian equities. His overweights include energy, financials and the consumer discretionary sector. 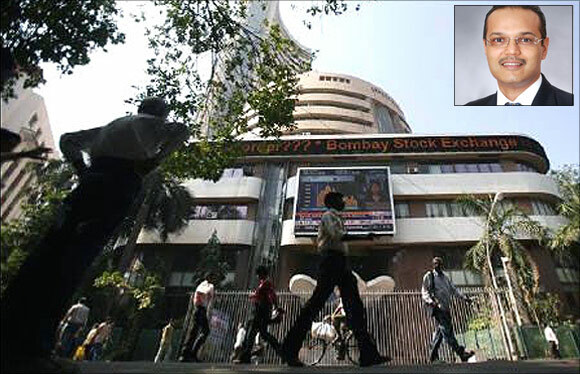 Image: Bombay Stock Exchange, Ridham Desai (Inset). What happens if quantitative easing (QE) ends? If the market starts believing that there is going to be a disruptive end to QE, it won't be pretty for Indian equities. There will be a lot more volatility. You have seen that it is getting more volatile. That said, we don't think there is going to be an abrupt end. India is still like a good house in a bad neighbourhood. At large, the world remains a very challenged neighbourhood, especially, the equity asset class. India represents one of the better places. Investors know that. So you will see that people will come and buy the dip. So could we be looking at new highs soon? We expect that to happen in second half of this year. Our index target is 23,000. I expected new all-time highs to be a second quarter event. So we have a month to go, so let's see. But you are measuring the index on a nominal basis. You should deflate it by book or earnings. If you do so, you will see that we are at October 2003 levels. Corporate earnings have grown a lot in the last ten years. The index has not kept pace with it. The nominal index will go to an all-time high, if it has much meaning. Psychologically, yes it will be important. Retail investors will probably start looking at markets again. Flows don't lead the market. They follow the market. 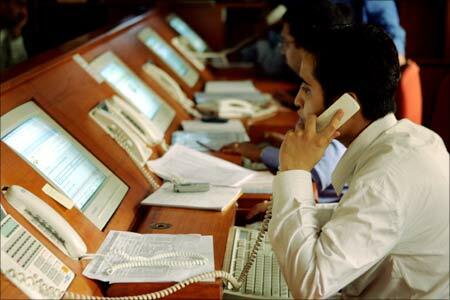 Domestic investors will buy when trailing returns get better. Trailing equity returns in India are actually negative on a real basis. So domestic investors have not bought equities and they are right. The only asset class which has given them positive real returns in the last five years is gold. So how significant could the impact of a fall in gold prices be? Could one begin to see an effect on consumption patterns as the wealth effect erodes? Gold holdings in India at its peak was about $2 trillion by our estimates, more than the entire GDP of the country; and about six times more than the household holdings of equity. The decline in gold prices since then is equal to the total household holdings in equity. About $300 billion have been wiped out. The wealth effect erosion will be there, but it will not be as prominent because this number has gone from around $150 billion to $2 trillion. The first reaction to lower gold prices is everybody flocks to buy gold. You saw that in April. That will now wane if gold prices don't go up. When stock markets peaked in January '08, the quarter ended March saw the biggest inflow into domestic mutual funds in India's history. 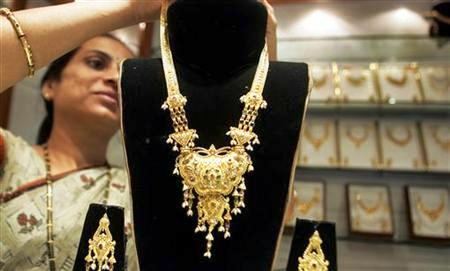 Image: A worker displays gold jewellery at a shop in Mumbai. Toh woh gold ka bhi wohi hoga. First two to three months you tend to buy, then the demand starts getting affected if prices don't go up. We are yet to see all these things...And you have to see all of these things in rupee terms not dollar terms. Speaking of the rupee, is the recent decline likely to act as a headwind for FII inflows? Well, if it gets more pointed. But in our view it won't. The recent decline is more to do with the dollar in our view, rather than the rupee's weakness. 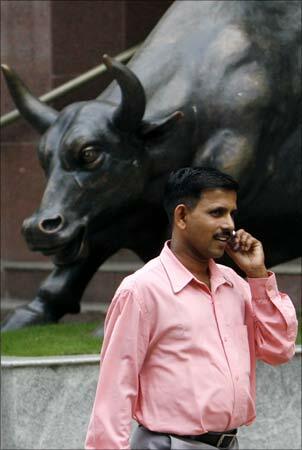 What about elections, are they going to be a big factor for the markets in the days ahead? If you look at history, the markets tend to actually run up ahead of elections, not fall. The markets tend to price in a good election outcome. At some point in time, the markets will actually get exuberant about a strong outcome. At that time, investors are advised to buy protection. Any books that can be said to have influenced you? I think behavioural finance is certainly something worth paying attention to, because human behavior is very anchored...and it takes a lot of time for those anchorings to shift. Behavioural finance gives you a tool to time yourself better. And as a market analyst, the biggest problem is making a call too early. Especially, in the context of my client's investment horizon. If I am making an investment personally, it is not material if I make a call too early because ultimately I am pursuing a certain return. If my return is achieved, its ok.